Schematic drawing of a single superconducting memory cell. Despite the potential of superconductor-based electronics to significantly impact the electronics industry – for example, a superconducting computer chip is a thousand times faster than the one within the laptop I'm using right now – they have not taken off the way some researchers anticipated. One reason may be that superconducting memory chips are just not dense enough; they can only hold up to 16 kilobits of information, compared to up to several gigabits delivered by other chips. But now, a team of scientists from the University of Augsburg in Germany and Stanford University has taken steps to help fix this problem. They have proposed a superconducting memory concept that uses a ferromagnetic material to store data. “We have made significant improvement to superconducting memory, and we hope that our design can be integrated into current devices on a large scale and operated at high speeds,” said the study's corresponding scientist, University of Augsburg physicist Jochen Mannhart, to PhysOrg.com. Current superconducting memory devices have several disadvantages, but perhaps the most prevalent is their large size. This is due to the way these devices store data: Bits of information take the form of basic units, or “quanta,” of magnetic flux (flux being a measure of the strength and extent of a magnetic field). These flux quanta occupy a relatively large amount of space, however, and are stored in circuit components called superconducting quantum interference devices (SQUIDs) that must be large to accommodate them. Mannhart and his team overcame this size limitation by rethinking memory cell design. 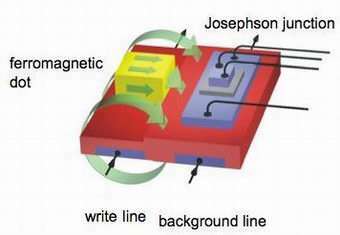 Their concept stores data by coupling tiny ferromagnetic “dots” to electronic components called Josephson junctions – current-conducting “sandwiches” formed by a thin layer of an insulating material between two superconducting layers. To write bits of data to the cell, a current flowing down a “write line” creates a magnetic field that magnetizes the dots. The direction of each dot's magnetic field – pointing toward the Josephson junction or away from it – determines whether the dot will correspond to a “0” or a “1.” It is the job of the Josephson junction to make that determination. It does this by adding its own magnetic field to a background magnetic field, which is generated by a direct current running under it. Because the strength of the resulting field depends on the direction of the dot's field, knowing the former allows one to know the latter. This memory concept gets around the size issue because the dimensions of the ferromagnetic dots and their distance from the Josephson junctions do not compromise the operation of the cell. The dots can be very small and very close to the junctions, and the cell will still function properly. The group tested their concept by fabricating a memory chip out of the metal niobium (Nb). The chip consists of a pattern of several Nb Josephson junction arrays, with eight junctions per array. Each junction is coupled to a ferromagnetic dot that is 6 micrometers wide, 9 micrometers long, and 600 nanometers thick. There are many ferromagnetic materials that would work, but for this first test the group chose a nickel-iron compound commonly known as Permalloy. This work is reported in the October 19, 2006, online edition of Applied Physics Letters. If they worked in room temperature they would be everywhere by now. The energy, cost and size of cooling infrastructure is what makes them welcome only in a few niche applications (like generation of huge magnetic fields for NMR, mass spectrometry or particle accelerators for example).